The Doulton Flock of Pedigree Border Leicesters. All our sheep are bred to produce style, size, good tight skin and conformation. Shearling rams available for sale from Kelso Ram Sales and Welshpool. Shearling rams, shearling ewes also available directly from the farm. Borderleicester ewes and rams available for export. Rams used 2017 - Westforth Zeus, Silvermuir Superman,. Doulton Gentleman Jim (sired by Kilphin Gentleman Jim) , Lyham Viking and Hildenley Oligarch. Come and visit us at home! 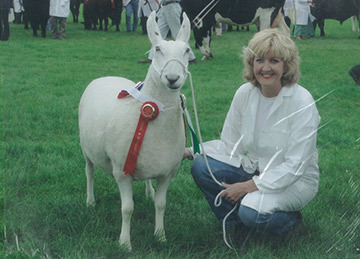 I started breeding Border Leicester sheep at Nunthorpe in 1997 with the purchase of two ewe lambs from Lanark. The intention was never to grow to the current day size, but having fallen in love with the breed from the first encounter, and with a lot of help and guidance from veteran Flockmaster, Jim Stobo of Nabdean, Berwick, we have produced a flock to be proud of, producing sheep with superb conformation, carcass,excellent tight skins, good mouths and white hair. We constantly strive to produce what the commercial buyer wants for his ewes, doing this by selective breeding of good stock with all the correct attributes. We have tried our hardest to produce what the end customer wants. We must not forget that the Border Leicester is the "sheep industries great improver", and whilst it is very nice to produce rams with "big lugs" and all the other fine attributes, we must remember that the majority of these sheep go to commercial men. These flocks quite often lamb outside, up on hills and need lambs which will survive inclement weather. Good tight skins, good conformation and mouths are needed. As one commercial man put to me "there is no requirement for a lamb whose coat divides in wet weather. We try our very best to produce a good end product, one which will do the job required and ensure that the customer comes back to the Border Leicester again and again for all the right reasons. 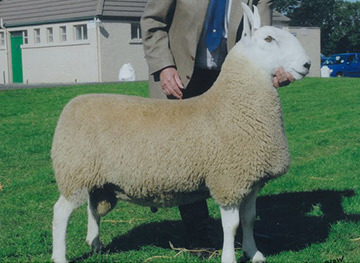 Rams are sold at Kelso and Welshpool each year and the flock consistently does well at both. Sheep are also sold privately from home. We have now exported both ewes and rams to Holland, Italy, Switzerland and Germany for many years now and our buyers have been extremely pleased with the lambs the sheep have produced. Those who have started their own mini flocks are extremely happy with the progeny, whilst those who have bought rams to put onto other breeds have expressed their delight with the lambs produced by the crossing. We prefer to sell from home and think it is much better for all concerned. The buyer can see the sire and dam of the Border leicester ram, he can see it's environment and how it is produced and fed. We have had a lot of comments at sales from buyers who bought rams of all breeds previously, taken them home and watched them shrink in front of their eyes. Overfeeding is not good for the animal at all.